Amazon, which has come under fire for treating warehouse workers "as robots," is now deflecting criticism for a 2016 patent that proposed to house workers in cages. The patent was highlighted in a recent article by two AI researchers, who wrote that the design illustrated "an extraordinary illustration of worker alienation, a stark moment in the relationship between humans and machines." 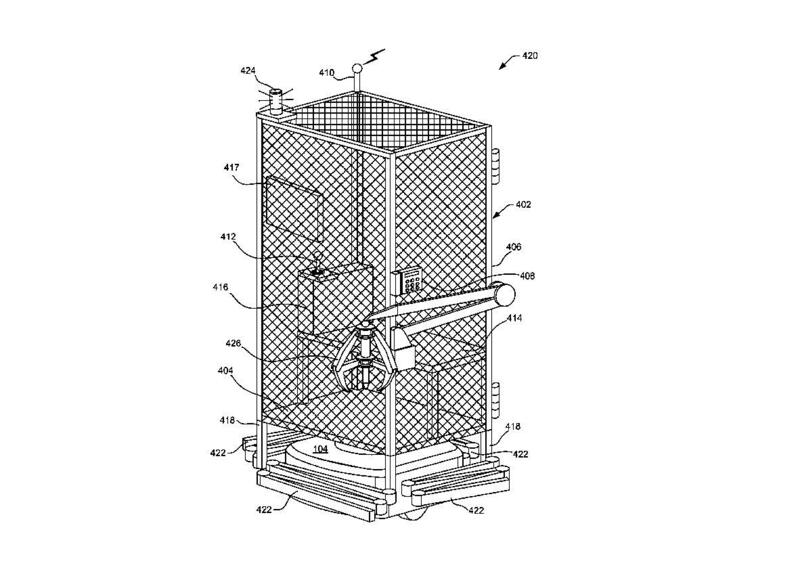 While the optics of placing a worker inside a cage certainly aren't good, the patent's purpose was geared toward employee safety, rather than confinement. The caged mobile workspace was designed to keep humans safe as they entered warehouse floors where robots zoom around, pushing towering shelves of goods ordered by Amazon customers. An Amazon executive, Dave Clark, wrote on Twitter that the company doesn't plan on using the design. "Sometimes even bad ideas get submitted for patents," wrote Clark, senior vice president of operations at Amazon, responding to a Seattle Times article about the patent. "This was never used and we have no plans for usage." An Amazon spokeswoman said the speculation about the patent was "misguided." She added, "Like many companies, we file a number of forward-looking patent applications." The AI researchers, New York University distinguished research professor Kate Crawford and Share Foundation director Vladan Joler, described the patent as a symbol of an "unevenly distributed dystopian regime," where the few at the top of the wealth pyramid live in "extraordinary wealth and comfort." "But the majority of the pyramids are made from the dark tunnels of mines, radioactive waste lakes, discarded shipping containers, and corporate factory dormitories," they added. Even as a concept, the design is striking a nerve with some consumers at a time when the wealthiest Americans are enjoying higher wages and income, while many lower-income and middle-class families struggle to cover their basic needs. Automation -- like the robots used inside Amazon's warehouse -- has been blamed for hollowing out middle-class occupations and pushing workers into jobs with less stability and lower wages. Working conditions inside Amazon warehouses came under scrutiny earlier this year in "Hired," a book about low-wage work in the U.K. by journalist James Bloodworth, who worked undercover at one of the retailer's English warehouses. He depicted a workplace where workers are treated like "robots," a claim that Amazon disputed.